Two biologists are in the field following the tracks of a radio-collared grizzly bear. All of a sudden, the bear crashes out of the brush and heads right for them. They scramble up the nearest tree, but the bear starts climbing up the tree after them. The first biologist starts taking off his heavy leather hiking boots and pulls a pair of sleek running shoes from his back-pack. The second biologist gives him a puzzled look and says, "What in the world are you doing?" He replies, "I figure when the bear gets close to us, we'll jump down and make a run for it." The second guy says, "Are you crazy? We both know you can't outrun a full-grown grizzly bear." 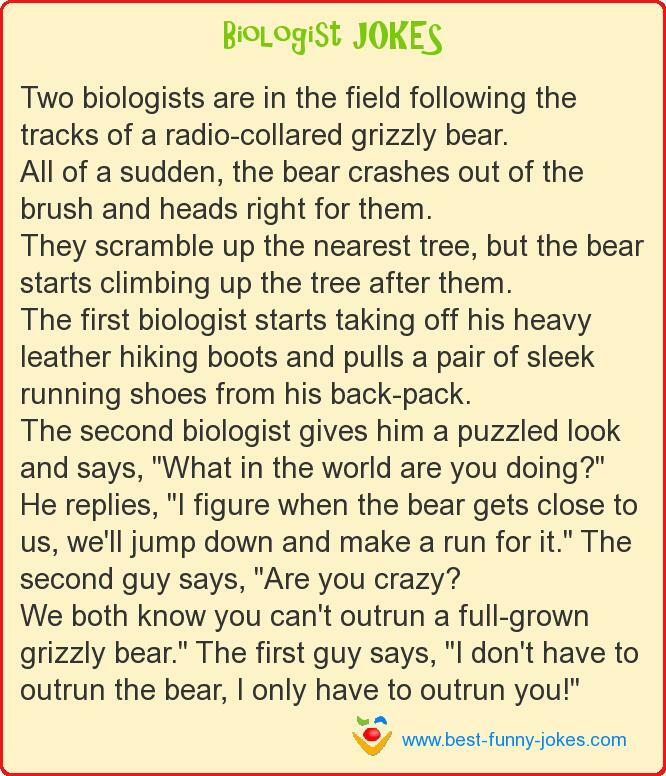 The first guy says, "I don't have to outrun the bear, I only have to outrun you!"